On offer is a carefully curated list, with labels outside of the whisky mainstream at friendly prices. But that doesn't mean they don't have the exclusive and expensive good stuff. Look up from across from the bar to the glass showcase up high. Safely ensconced within are some amazingly rare editions, including first editions. They have every single year's Glenfarclas from 1952. Don't miss the staircase at the back. There's a "million dollar" display window holding some of the most expensive whisky. Most of these are not for sale; they are too valuable. 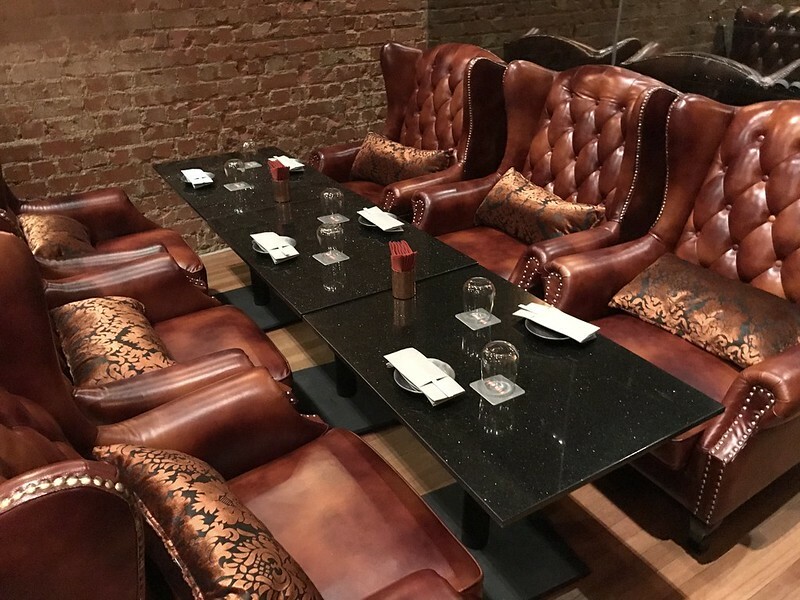 Upstairs you'll see leather chairs in a low-lit lounge, and an exclusive private room hidden behind a wall of wines. 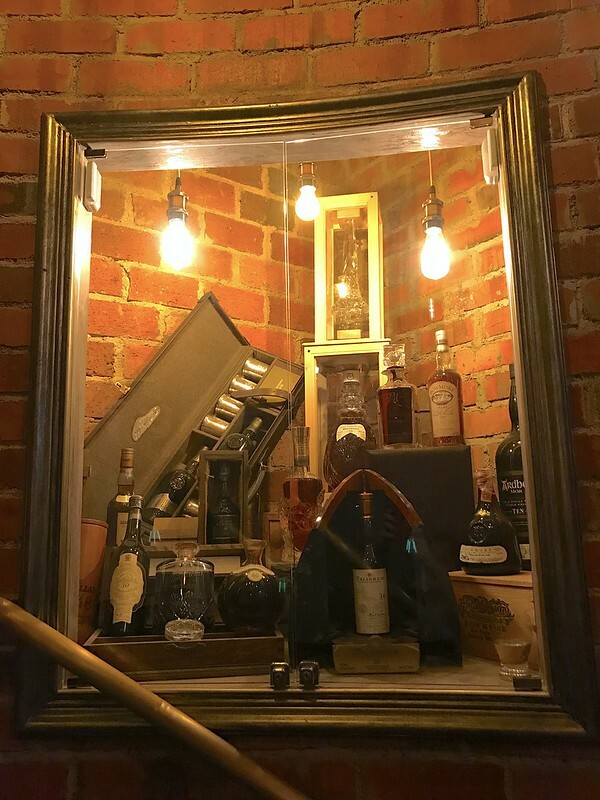 The gems in The Wall’s rare whisky cellar are plentiful enough, but the megastars include the Yamazaki 50yrs, distilled in 1961 with only 150 bottles worldwide; the (Crystal) Black Bowmore 29yrs 1st edition, with only 5 casks created; and The Macallan 1948 Select Reserve 51yrs, with only 366 bottles available. 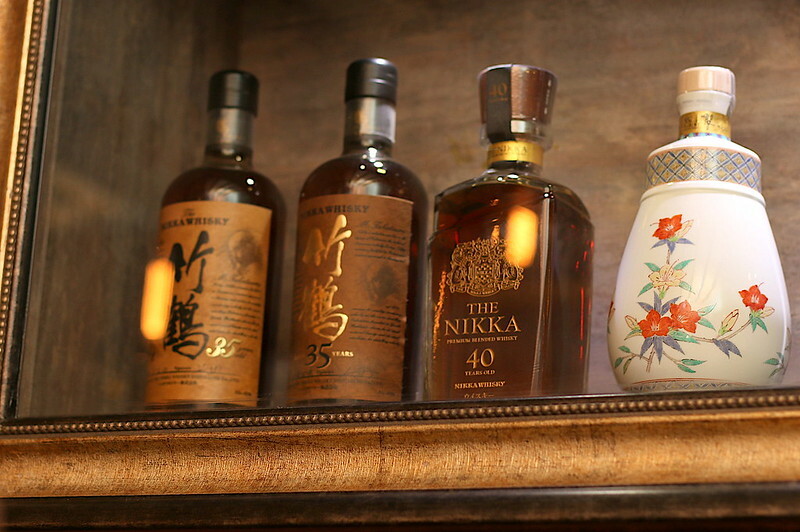 “At The Wall we hope to bring forth the natural expression of a whisky. We will constantly source for more unique Independent Bottler whiskies where the whiskies are bottled at casks strength displaying the full flavour of the barrel and elements of the environment they were produced in,” said Han Wen, co-owner. 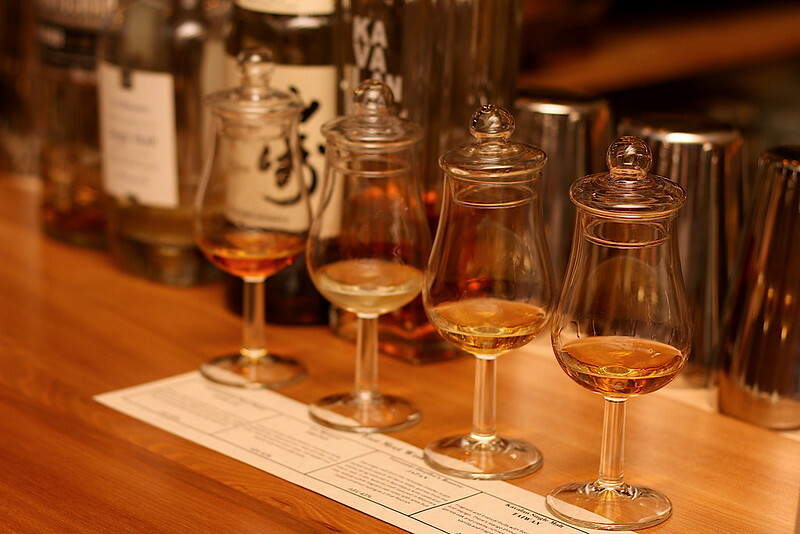 If you'd like to try different types, The Flight is a nice "sampler" of four whiskies. 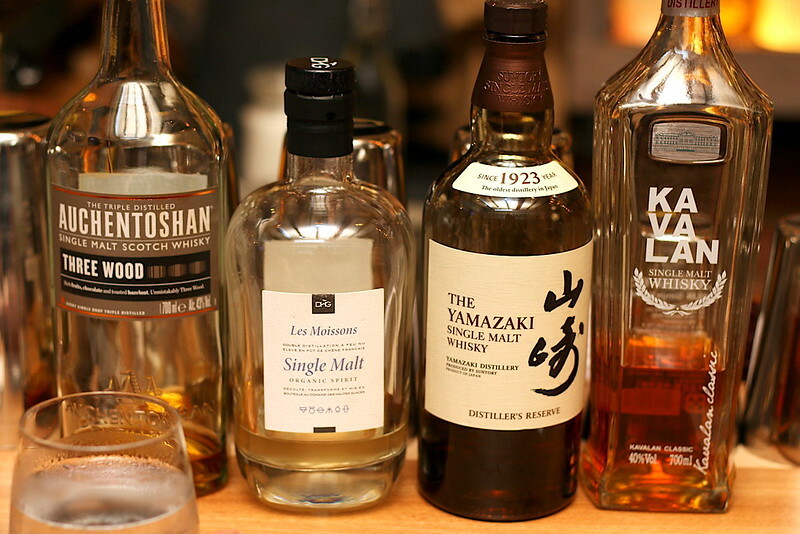 This "East Meets West" (S$37) gives you a variety of easy to drink whisky from both Europe and Asia. Auchentoshan (pronounced 'OKKen-TOSHan') Three Wood (Scotland): This golden bronze liqueur is sweet, intense and complex with aromas of blackcurrant, brown sugar, orange, plum and raisin aroma with fruit and syrup taste. The finish is fresh and fruity with long oaky sweetness. Les Moissons (France): This one is fairly grassy, calling to mind white flowers, mountains herbs, malted barley, and apricots. It's deep, silky, full-bodied and intense with a biscuit after-taste. Yamazaki Distiller Reserve (Japan): The strongest one of the lot, alcohol-wise, this single malt carries berry notes from being aged in Bordeaux wine casks. 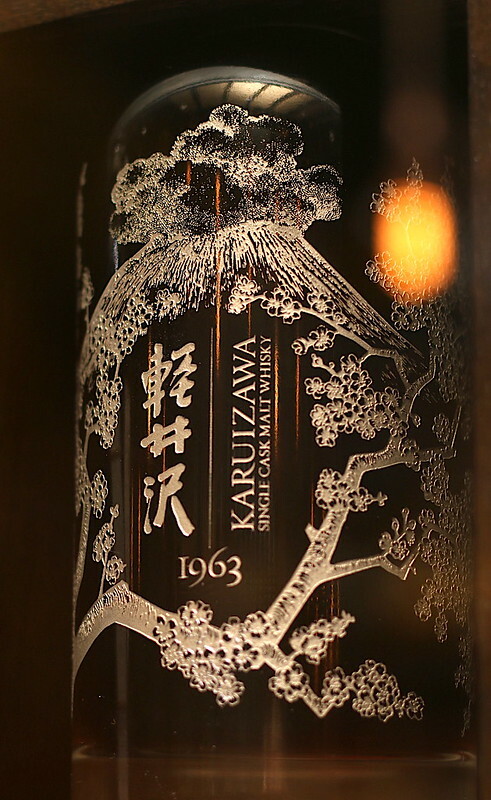 The malt is matured in Mizunara (Japanese oak) casks which lend subtle oak notes with spicy and sweet cinnamon as a final flourish. Single Malt Kavalan (Taiwan): I was briefly reminded of Taiwanese fruit beers. This is fragrant and tropical with floral notes, vanilla and mango. 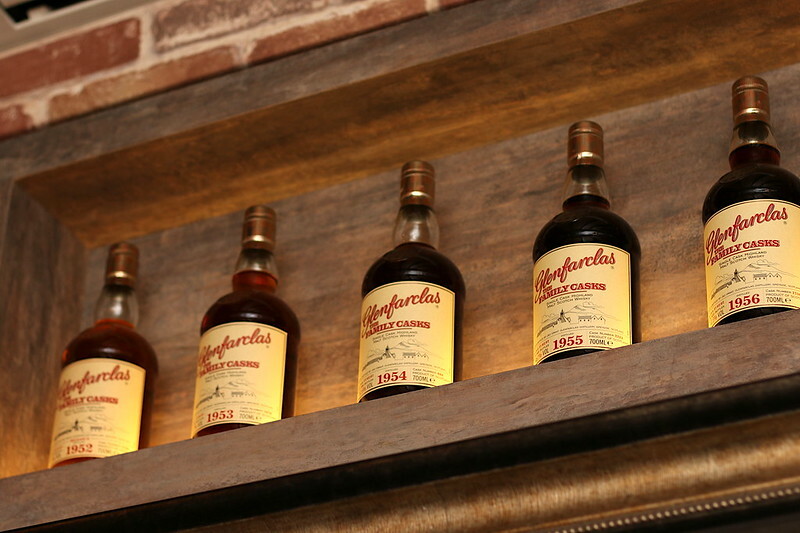 The Wall is one of the few whisky bars that serves a full food menu. Whisky is no longer an after-dinner enjoyment. It's something you can pair straight with food. Pairing whisky with sumiyaki is a specialty here, and I have to confess that not being a drinker, I enjoyed the sumiyaki a lot more than the alcohol. This set (S$12) is a special menu only available together with The Flight. Normal prices are S$6 per stick. From left to right: Tebasaki (chicken wing), Kashiwa (chicken thigh), Tsukune (homemade chicken ball) and Negima (chicken thigh and leek). 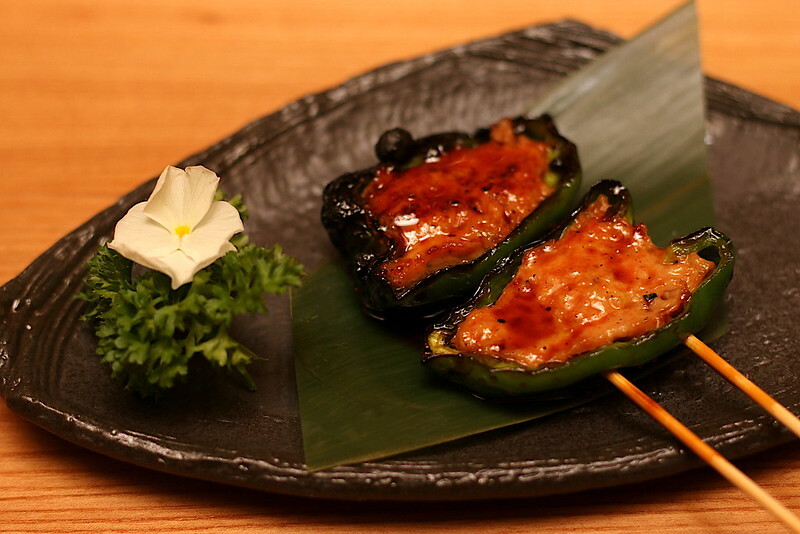 Special mention goes to the Tsukune which has chopped cartilage mixed into the chicken mince for texture. 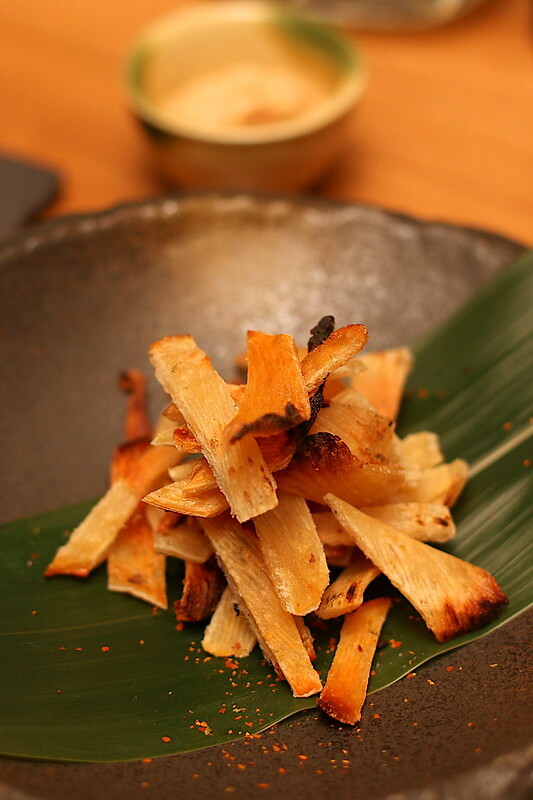 God, I love the crunch of cartilage, and this completely turned around what used to be the most boring yakitori item ever. Tsukune is usually too mushy or too plain hard. This had softness, body and crunch all at once. Brilliant. 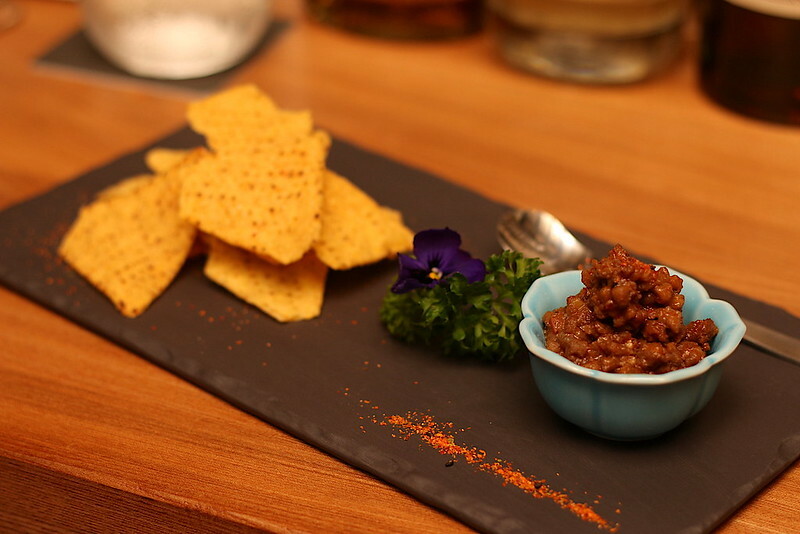 Choose also from appetisers like the Miso Nachos (S$8). 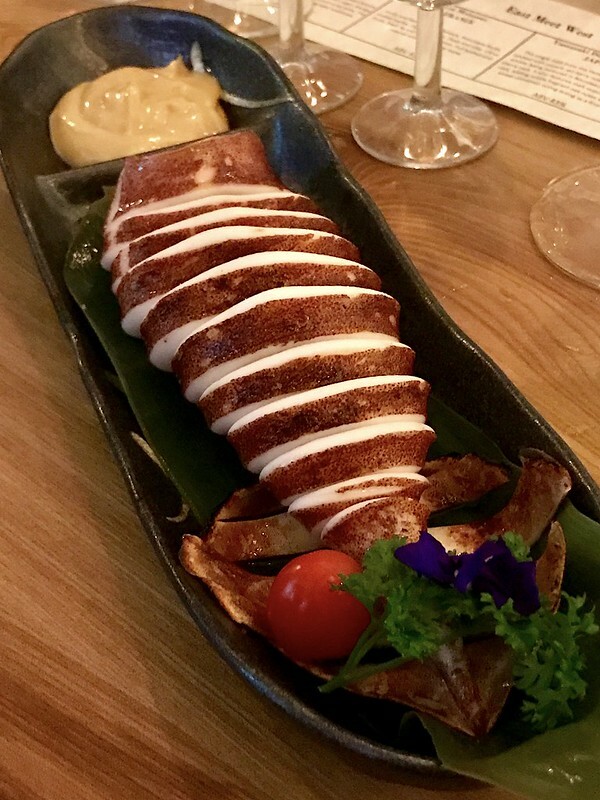 Ehire or Grilled Skate Fin (S$15) with spicy mayo. 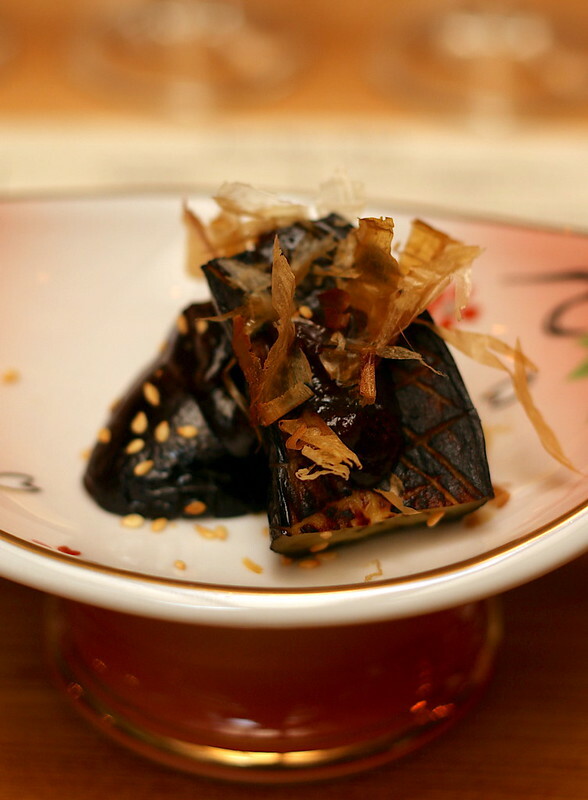 Miso Nasu (S$6) grilled eggplant brushed with butter and and a special miso sauce. If you don't like whisky, you can opt for cocktails and mocktails. 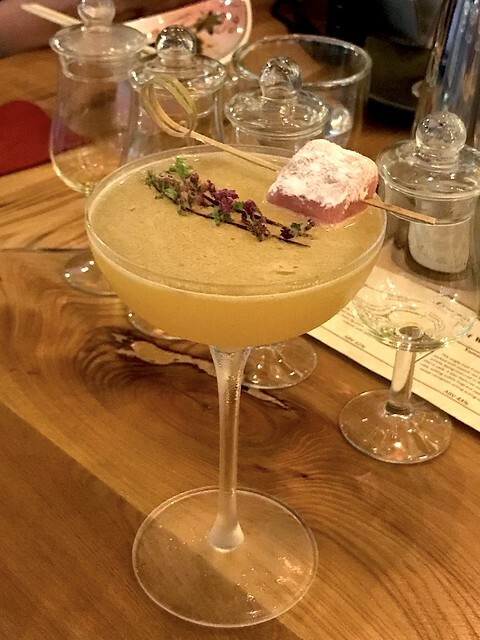 This is a bespoke yuzu cocktail, topped with mochi on a stick. 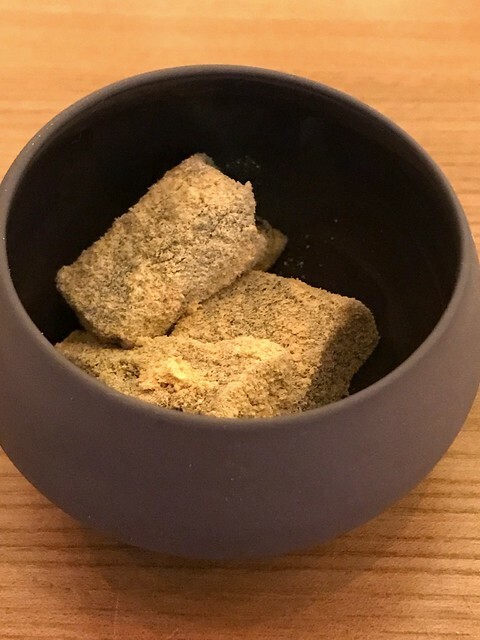 Dessert can be really simple but irresistible, like this refreshing warabi mochi (S$10). 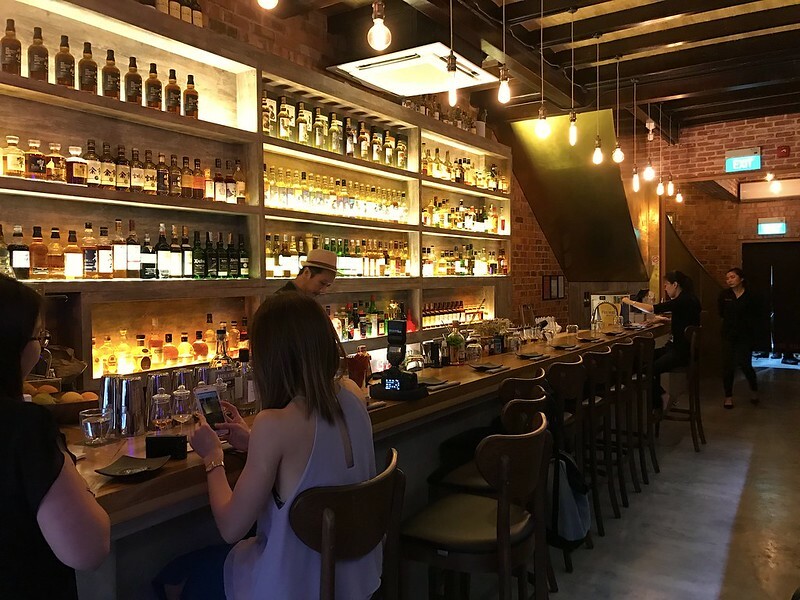 With prices from S$14 a glass, and a full sumiyaki menu, you can expect this place to be quite popular.